After we had our first snow this year Zoe and I went for a walk. It was a nice snow. All fluffy. The kind that's perfect for snowballs and snowmen. It was nice. Since then... every time we have any snow (or anything that looks like snow) Zoe tells me she "needs" to walk. Luckily the weather has been mild, so there haven't been too many winter walks. 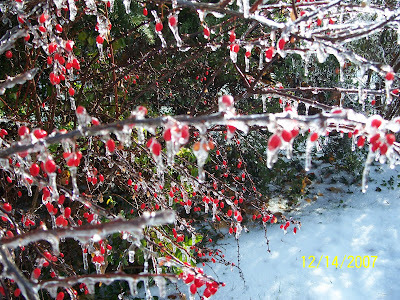 Last week we did have some snow/sleet/slush fall from the sky. It was not nice. I did not really want to walk... but Zoe did. So, when school was over at noon I complied. It was warming up... and everything was covered in melting ice. 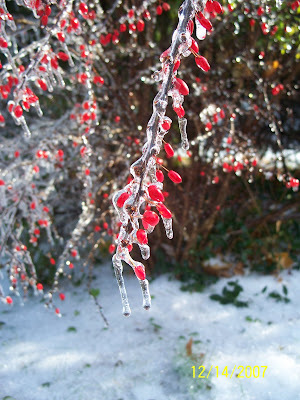 I wish we were out before most of the melting... but I was able to capture a little bit of frozen beauty. I will call this my "best shot" this week. There is just something I like about the way the background is in focus and the foreground is blurred. Zoe took her mittens off to do some "berry picking". She exclaimed "These are my favorite! yummy!" We had a quick talk about how she can't just go eating berries outside. 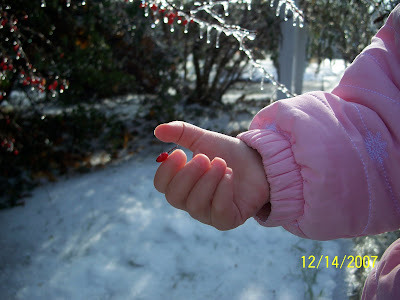 She wasn't too happy with the berries anyway after they stuck frozen to her fingers.